Notes: 1. Nursery schools (part-time) are not regulated in Quebec, Saskatchewan and the Yukon, and so are not included in these figures. 2.Quebec’s figures include school-age spaces which are under the aegis of the Ministère de l’Éducation, du Loisir et du Sport. Source: CICH graphic created using data adapted from Friendly, M., Grady, B., Macdonald, L., & Forer, B. (2015). Early childhood education and care in Canada 2014. http://www.childcarecanada.org/publications/ecec-canada/16/03/early-childhood-education-and-care-canada-2014 -accessed July 24, 2017. 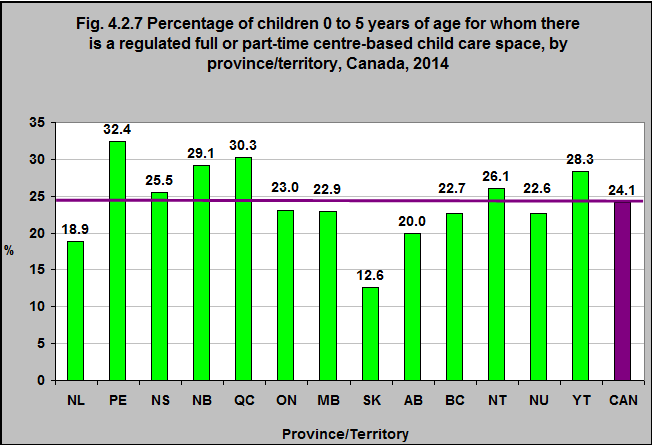 The proportion of children under 6 who have access to a regulated, full- or part-time centre-based child care space varied by province and territory in 2014. In Prince Edward Island, almost one-third of children under 6 had access to such a space. That was the case for 13% of children in Saskatchewan and 19% in Newfoundland & Labrador.